Each character gets their moment to shine and the way characters are introduced often gives a quick insight into what sort of person to shine, my favourite character introduction was Rich Purnell (Donald Glover) and all his scenes were great, especially as you slowly see what he’s up to before he meets everyone else. When it comes to the people of NASA, they may not always agree – the only real conflict is between Head of NASA Teddy (Jeff Daniels) and crew supervisor Mitch (Sean Bean) and they still both want to do what’s best by everyone involved – but it was amazing to watch these characters pull together to try and save one man. There’s no real villain of the film which is a bit of a surprise when it’s in the sci-fi/disaster genre, in another life Teddy could have been made out to be the bad corporate guy but he ends up being a pretty well-rounded character. The soundtrack is surprising and it’s on a par with Guardians of the Galaxy’s thanks to Commander Lewis’s (Jessica Chastain) love of disco music. The joy when Watney is travelling across Mars in the Rover to the sound of ABBA’s Waterloo is out of this world. 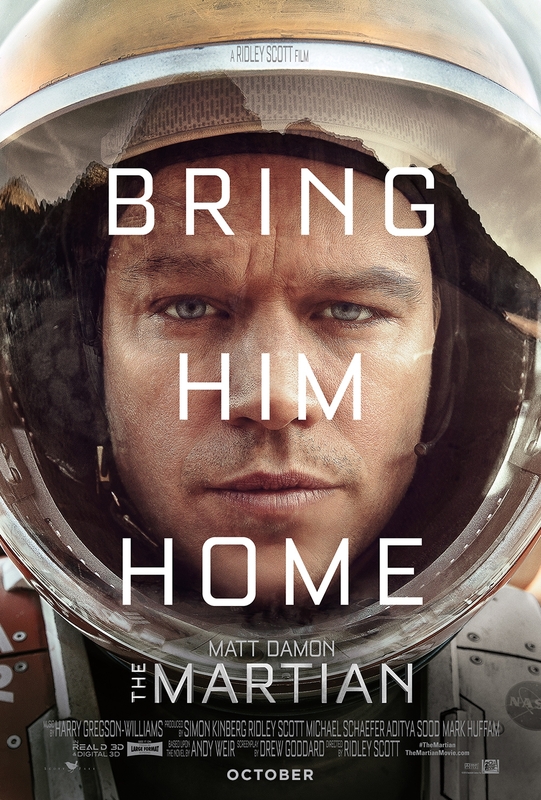 The Martian is not only a great film but it one of the best adaptations of a book I’ve ever seen. It keeps the humour, the likable characters and the tension of the book but gives you beautiful visuals and an amazing cast full of chemistry. Just like the book it also makes all the technical jargon and the science accessible and you can truly believe that these characters are as smart as they are. The Martian is the most fun I’ve had at the cinema in a long time, it filled me with joy and with such a great script and an amazing cast The Martian is one of the best films of the year. 5/5. I loved the book just as much and you can find my review of it here.